This post originally appeared on January 5, 2009. It was substantially revised and re-posted on August 11, 2014. Kai might be more stylish for boys born in 2014, but this name remains more popular. 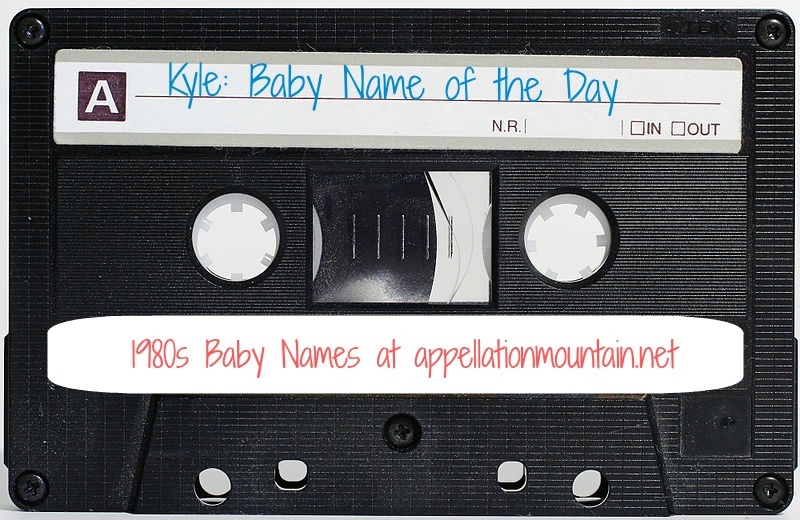 Thanks to Skye for suggesting our Baby Name of the Day: Kyle. Parents tend to play it safe when naming their sons. The enduring classics – think William and Joseph – tend to be used and re-used. And yet there’s a growing category of modern classics, names that would have been rare in the nineteenth century, but have become solidly established in recent decades. File Kyle in that category. During the nineteenth century, only a few boys received the name every year. But he gained steam throughout the twentieth century, reaching the Top 100 in 1974 and staying there through 2009. The meaning is usually given as channel or strait, from the Gaelic caol. 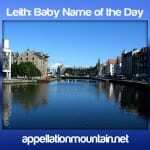 The term is still used for bodies of water in Scotland today. It’s sometimes a surname, derived from the place. There’s also Scotland’s Kyle District, complete with the ruins of Kyle Castle. The district was folded into another county in 1889. Places called Kyle remain on the map in the US, Canada and Australia. 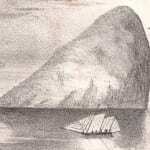 The region suggests yet another possible meaning for Kyle: legend says it was named after Old King Cole. Before the merry old soul inspired his nursery rhyme, he was a semi-legendary King of the Britons. Cole traces back to the Roman Coelius or perhaps Caelestis. The latter survived as Celestine and means heavenly. In the 1920s and 30s, Beatrice Kyle was a world famous high diver, performing stunts all over the globe. Television presenter Jeremy Kyle hosts a British version of The Jerry Springer Show. When she was first introduced, the comic book Catwoman was the secret of identity of whip-carrying burglar Selina Kyle. Kyle may have recently left the Top 100, but the Ky sound remains current. There’s Kai, as well as Kyle-Tyler smoosh Kyler. On the girls’ side, Kylie – pick your spelling – has had a good run, along with Kyla. Sky, Skye, Skylar, and Skyler have all seen use for boys and girls. Maybe that’s one of his drawbacks – Kyle has been around long enough that he’s in dad-name territory, and with all of those other Ky- names, he doesn’t feel very original. But if you can overlook the possibility that your son might sometimes share a classroom with Skyleah or Kyson, the name offers up an appealing compromise. While his history is undeniable, he’s very much a modern name. His sister could be the equally sensible Melissa or Rachel as easily as the intriguing Scottish Elspeth or Isobel. While Kyle is no longer exciting and new, that could be his strongest asset. Do you think Kyle is a modern classic, or a fading trend? Are there other K names for boys that you prefer? Definitely a modern classic – it’s my youngest brother’s name! He’s 29 🙂 I actually think all four of us siblings have modern classic names. We’re Brooke, Troy, Courtney and Kyle. It feels like it’s been a long time since I’ve met a young Kyle though. It’s a shame, I think it fits in really well with a lot of the names that are currently popular. I know a 9 y.o. Kyle! His parents wanted something “normal” but felt like William, Robert, John, James, etc. weren’t quite their style. I grew up with a female Kyle, in face her full name is Kyle Matthew S….. She was named for her grandfathers. I love the name Kyle for a girl, or a boy. Until I was in 8th grade or so, even being the name nerd I was, I always thought Kyle was a girls name, then a boy named Kyle moved into out school and I realized she actually had a boys name haha. To me it has always been universally either or. To me, it is a strong name for a Female, yet a softer name for a male, but definitely beloved. I would use it, but having a niece named Kylie means it is out for me, too bad. Hate Kyle. I immediately think of the South Park character, and then all the wimpy boys I’ve known with that name. And now there are a million girls named Kylee, Kaileigh, etc… no thanks. I am a female Kyle, and I love my name. I’m even going to name my daughter after me, someday, if I have one. I never thought of my name as anything but MY name, not a boys name, not a girls name, just something that I’ve always been called, and I LOVE it. I would never trade my name for any other. I say this because I know of a lot of girls with more masculine names that HATE it, but I love being the only girl Kyle in my entire school, and though I am more masculine than most of my female friends, I enjoy immensely the fact that I can go both ways and sometimes tease people about guessing my gender. While doing a funny little google search about names that I found on facebook I came across this website, and I gotta be honest the internet never ceases to amaze me. I’m guessing this is a site about prospective baby names, or perhaps a blog I didnt diligently track down its origin. I was amazed to hear what people think of my name, and those who share it. My parents liked it because of its celtic origins, and its rather less than used status. I can say I only ever met about 2 other Kyles, and I live in a city of 350,000 people. I was particulary interested to see the person providing the alliteration for the name, bile and pile. To point out to this person, it also rhymes with smile. I guess youd need to be a cup half full kind of person to see that one 🙂 . As for the Asian dialect not meshing with the name, i can attest to that. I had a japanese exchange student sophomore year of college and he never got close to saying my name lol. All in all I kinda like my name, i mean its better than its terribly close cousin “Lyle”. I guess the take home message from this one is give us Kyle’s a chance, we arent half bad. And also to all future parents looking for names, the name you give your kid isnt half as important as the love. I for one still think Rufus is do for a comeback……any day now. I like your point that Kyle rhymes with smile. And I think you’re absolutely right about Rufus! Not among my favorites, but I never mind running into a Kyle.. I know one who is about 5, but too me it does not sound middle-aged.. more like a 20 to 30 something. I never ran into any among people my age (40s). Kevin and Scott, now, are certainly sounding middle-aged. . though I have a cousin Kevin in his early 20s. Several Kyles among the contemporaries of my 20-30’s cousins.. friends of Jason, Justin and Evan. I can’t get excited about him either, Bnb and Jne have already touched upon the main reason and that’s the sound – so harsh! I don’t know, he just feels a bit flat to me. Kyle and Ryan are two that strike me more and more as popular gender neutral choices, though I think they both still wear well on boys. The K really is an issue, isn’t it? But overall, I still think he qualifies as a modern Michael or Christopher – perfectly wearable, just not exciting. Friends of ours chose it for exactly that reason. They wanted a “normal” name *and* wanted to break away from family naming traditions. It will be interesting to see how Kyle fares in, say, 2040. Will he be forgotten or will he be in the midst of a revival? It’s funny that you mention Michael. In German, Michael is prn. more like mic-ky-el, making Kyle seem like a natural nn for Michael. I like Kyle but it never made it into my lists for MY kids’ names. My first boss named her first-born daughter Barbara Kyle in the early 70s. 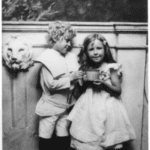 Barbara was after a friend; Kyle she used simply because she liked it although even she thought of it as a boy’s name. I’m tired of K names! It is nice to see that Kyle has a surprizingly long history, though. I have to say, I agree with the others, Kyle is not for me. I’m not sure what it is – BNB probably gets closest to the reason for me. It’s the sound. I wouldn’t be surprised or anything to run into a Kyle child. It’s a name I wouldn’t think twice about – kind of like most of the well-used classics (think Michael, John)… yep, it’s a name. Unfortunately, Kyle has become purely female for me, as my college roommate was a female Kyle. All in all, it’s a nice name, just not for me. Nope. Can’t like him. I grew up with about a hundred Kyle dudes and while it’s turning into a lovely classic (ala Kenneth), he’s a bit too middle aged for this gal (I’m partnered witha Kenneth, I would never use it on a baby today, either). I also know one female Kyle and while I’m not fond of it on her at all, she’s a lovely woman. I don’t know, Naming a boy Kyle today strikes me the same as Kevin, Douglas or Scott. All Middle ages guys to me. Lovely enough but not fresh or interesting enough for me. (Actually Douglas doesn’t bother me nearly as much as the other two, maybe I knew less of them?) Weird. Kyle’s better than Aidan, as far as I’m concerned (my apologies to anyone with an Aidan) so if I ran into a little Kyle, I would probably be more surprised than shocked or outraged. Kyle’s okay but just. […] earlier this week, and so I thought this was timely: from the Quinnipiac Chronicle, a girl named Kyle who loves her name.